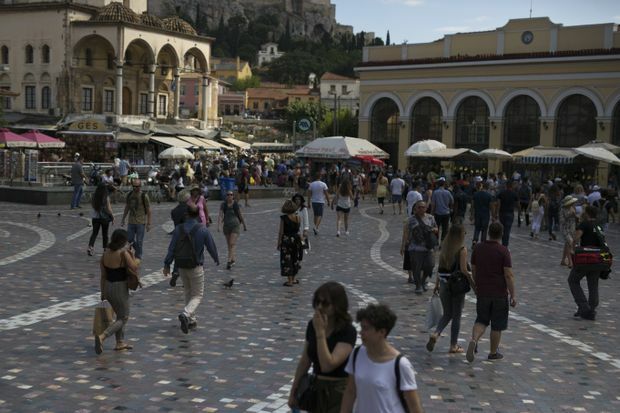 People walk at Monastiraki square in Athens on June 21, 2018. Greeks were unimpressed by a debt-relief package from eurozone Finance Ministers on Friday, jaded by years of austerity which has pushed a third of the population into poverty and shredded the government’s popularity. Greece has relied on loans from eurozone governments in three bailouts since 2010 in turn for painful reforms, including pension cuts and tax hikes, which have shrunk the economy by a quarter and had sent unemployment to record highs. Eurozone Finance Ministers sealed a deal in the early hours of Friday to extend maturities and defer interest rates on a big chunk of loans to Greece – the most indebted country in the eurozone. But the mood on the streets of Athens was cautious on Friday. “Our life will continue to be the same, our young people will (continue) to emigrate abroad, the rights of the elderly will be trampled on,” said Elvis Papanikolas, 28, a tourism-sector employee. “This situation will continue with half of Greeks taking medication or committing suicide and the other half unemployed,” he said. About 40 per cent of young people are out of a job, leading to the emigration of about 400,000 Greeks over the past decade. After a deep depression, Greece’s economy is slowly showing signs of recovery. The economy was poised to grow by about 2 per cent in 2018, but ordinary people are still having trouble paying their bills. “The debt relief is definitely a good thing for Greece, but it will take time for any positive effect to be reflected in the real economy,” said Anastasios Zois, 74, a pensioner. Greece is exiting its third international bailout in August, but despite hundreds of reforms requested by its creditors already being completed, investors still need to know if the country will be able to service a debt load worth of 180 per cent of gross domestic product. Athens will also get a new €15-billion ($23-billion) loan, giving it a total cash buffer of €24-million, which will help cover its financing needs for some 22 months. Many Greeks were unfamiliar with the terms of the deal, focusing more on the palpable impact of bailouts on their pockets. But with more pension cuts and tax hikes already legislated for 2019 and 2020 so that Athens keeps its finances on track, Greeks won’t expect their finances to improve any time soon. Prime Minister Alexis Tsipras’s left-right coalition has a fragile parliamentary majority and is trailing the conservative opposition by double digits in opinion polls. Mr. Tsipras on Friday hailed the decision by eurozone’s creditors to offer debt relief, saying it marked a definitive turn away from a relentless cycle of austerity. “I think that Greek people will soon realize the positive changes that will happen both in 2018 and in the comings years from the fiscal room that is being created,” Mr. Tsipras added. However, the resigned public response suggests the debt may not give much impetus to the government’s hopes of being re-elected in a general election due by October, 2019. “What we have here is one more dose of medicine for the patient,” said Alexis Kalambokis, 28, who works at a leather-goods shop in central Athens.